Small pleasures, meaningful work, interesting people, simple vegetarian food, sun on her skin and a beautiful life makes her bow down in gratitude each day. 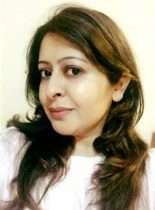 Meet our fabulous #WonderWomenWriter Preeti S Manaktala who bid adieu to her corporate life in the Insurance sector after graduating into motherhood so as to insure full love coverage for her own little beings. A trained Montessorian teacher with a dream of opening a school which would comfort and nurture young minds. A mother who is bent on creating lovable everlasting memories for her two boys. KEEP THAT CHILD IN YOU ALIVE! NOMINAL FEES, LOTS OF LOVE! Talk love. Know love. Accept love.